UPDATED 03-28-08: We SOLD OUT The Roxy Theatre! Tickets are no longer available for the April 13th Music of Battlestar Galactica concert. However, due to the overwhelming popular demand, we have added a second performance at the venue, TUESDAY, APRIL 15TH. Tickets are available now from Ticketmaster or directly from the Roxy Theatre. The first concert filled up faster than I expected, so I’d suggest moving quickly if you missed out and still want to see the show. The Tuesday night concert will be the exact same set list and performance as the Sunday night. However, it is still too early to confirm James Callis’ availability, due to the Battlestar Galactica production schedule. Therefore, our host is still officially “To Be Announced.” I’ll keep the updates coming as they become available. The wait is finally over! Tickets are now on sale for the 2008 Music of Battlestar Galactica concert, at the famed Roxy Theatre in Los Angeles. Here’s your only chance to see the score performed in concert by the brilliant musicians who play on the series every week. We will screen an original documentary about the Galactica score, and also have a CD signing with the full band. The evening will be hosted by the one and only James Callis! Like the 2006 concert, tickets are going to go fast. See you there! 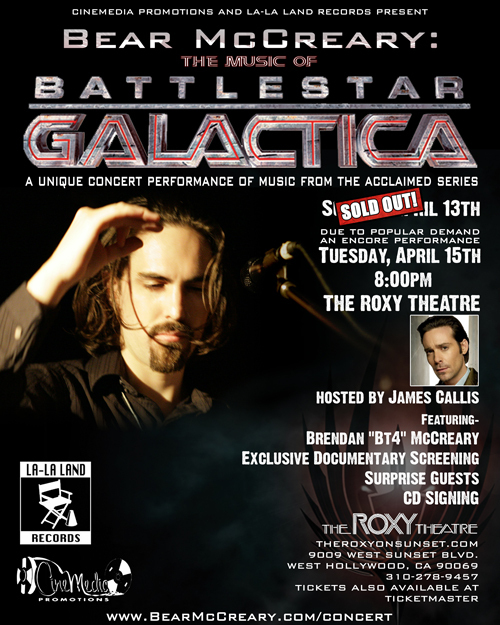 (March 07, 2008- Burbank, CA) – CineMedia Promotions, La-La Land Records, and Battlestar Galactica composer Bear McCreary present a special one night concert performance of the music from Battlestar Galactica, on April 13th at The Roxy Theatre in Los Angeles. Considered one of the top 10 shows currently on TV by Time Magazine, Entertainment Weekly and TV Guide, Battlestar Galactica won the prestigious Peabody Award in 2005. In 2006 in conjunction with the release of the Season 2 soundtrack CD, Bear McCreary and his ensemble performed a special one-night performance of the music of Season 2. The event was a huge success, selling out the venue. This year the event moves to a larger venue, the famed Roxy Theatre on the Sunset Strip. The performing ensemble, conducted by composer Bear McCreary, includes former members of Oingo Boingo, ethnic soloists representing instruments from around the world, strings, taiko drums and other percussion. Vocalist Brendan “Bt4” McCreary, who sings “All Along the Watchtower”from Season 3, will open. An original documentary about the making of the score will also be presented. James Callis (the show’s Dr. Gaius Baltar) will host the evening. Other members of the cast and production team will be in attendance. Co-presenters La-La Land Records have released four soundtrack recordings of the works of composer Bear McCreary: Wrong Turn 2, and the Battlestar Galactica: Season One, Season Two, and Season Three soundtracks. His scores for Rest Stop 2 and Eureka are slated for release later this year. The evening will also celebrate the 10th Anniversary of CineMedia Promotions, an independent publicity, web and radio promotions firm specializing in film soundtrack and cast album recordings. CineMedia Promotions, founded by Beth Krakower, has promoted all three of the soundtracks for Battlestar Galactica. Composer Bear McCreary also scores the hit series Terminator: The Sarah Connor Chronicles and Sci Fi Channel’s highest rated series, Eureka. His feature film credits include Wrong Turn 2 and Rest Stop. McCreary was among a handful of select protégés of late film music legend Elmer Bernstein (The Magnificent Seven) and is a classically trained composer with degrees in Composition and Recording Arts from the prestigious USC Thornton School of Music. In other concert news, I’m hoping to pull together a London performance. If you’re in the area, follow this link and help us generate some buzz. We can’t do it without you guys. I’m also coordinating a possible concert in Germany for next year. As always, keep your eyes out here for details as the emerge.